Washington Township resident Leslie Jeannet’s artistic talent earned her a new 55-gallon rain barrel! This summer, we invited the community to submit design proposals to paint the rain barrel outside the headquarters building at Activity Center Park. The prize? Supplies to paint the rain barrel, a new rain barrel to use at home, and displaying their art in a high traffic area! 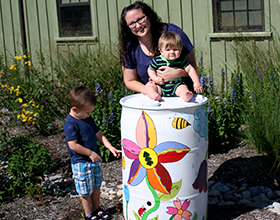 Jeannet (pictured with sons Silas and Paxton) recently painted her winning design on the Park District’s rain barrel and generously provided instructions to share with anyone interested in painting a rain barrel for their own home. Rain barrels are above ground storage containers designed to capture rainwater for reuse. They reduce rainwater runoff that pollutes local waterways with fertilizers and pesticides. Placing a rain barrel under your gutter’s downspout lets you collect runoff from your roof. From a spigot near the bottom of the barrel, you can hook up a garden hose, open the valve, and use the water for a wide variety of applications. Many homeowners use harvested rainwater to water lawns, plants and gardens. This steady supply of free water may even help you save money on your water bill!